TEP: What are some common concerns that folks have before choosing to start treatment? 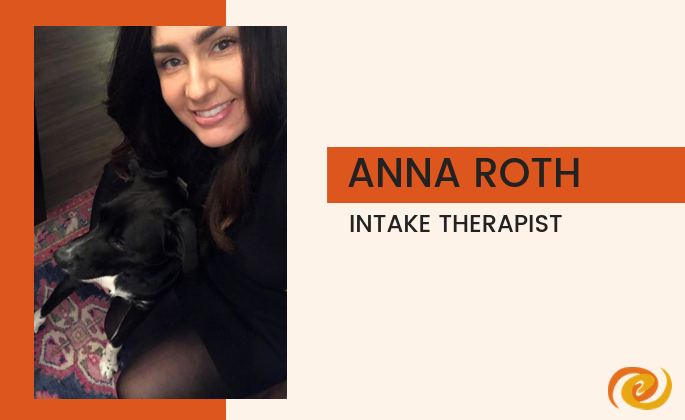 Anna: So many people that come in for an intake question the legitimacy of their need for help due to their weight or their eating concerns not fitting into a clear and extreme eating disorder stereotype. Because of this many people wait years, decades even before getting help. In my experience, how someone’s eating disorder looks is very individual. A key factor is mental pre-occupation- how much of one’s life and mental space is consumed by thoughts of food, weight and shape. In addition to wondering if their concern is legitimate, a couple of other concerns are logistics (what will insurance cover, how will I get time off of work, etc.) and the unknowns of where treatment will take them. TEP: You consider yourself to be a holistic psychologist, what does that mean? Anna: Good question. It’s not a technical title, more of a descriptive term to cue people into the way I view and approach mental health. To me working holistically means to look at all sides of a concern or mental health problem and strategically intervene at as many points as possible as gently as possible. I’m also a 500 hour Registered Yoga Teacher so the mind-body connection is something I regard highly as well. TEP: What are you most looking forward to this year? Anna: I am really looking forward to investing time and energy into building some hobbies! For the past 10 years, my life has been all about graduate school and clinical training. I want to learn Italian, cribbage, and become a better cook. Excited for more balance and fun :).